Education in early-day Oklahoma and Indian territories was limited to the availability of subscription, mission, and tribal schools. Generally, American Indian children had accessibility to all three, but blacks and whites could attend subscription and mission schools. Occasionally, tuition-paying white students attended tribal schools. Subscription schools were funded by a monthly tuition fee paid by the parents to the teachers. In turn, the teachers were responsible for securing a place of study and for paying the rent from their earnings. It was not uncommon for classes to be conducted in a tent, dugout, home, or church. Because the pay was low, many teachers were women, and they typically received one dollar per pupil per month. Attendance usually lasted a few months because children were needed to help with harvesting and other farm chores. The attendance of American Indian, white, and black scholars at subscription schools depended on their parents' ability to pay the tuition and on the availability of a teacher. An early subscription school that opened at Silver Lake (present Washington County) in 1874 served both Delaware and whites. In 1879 Joseph W. Scroggs, a Congregational minister, organized a school in Vinita, Cherokee Nation, Indian Territory (I.T. ), for American Indian and white students. In 1888 Frona Gibbens educated young people in a farmhouse northwest of present Dewey. Receiving fifty cents a month, she taught American Indian, white, and black students. The blacks were descendants of freed slaves. In I.T. some subscription schools opened strictly for the education of white children who could not attend tribal schools. For example, a school for whites was organized at Wewoka, Seminole Nation, and a few subscription schools educated the whites in the Chickasaw Nation. In the coal-mining area around Lehigh, Choctaw Nation, I.T., boys who worked in the mines attended school at night. Paying two dollars per month for tuition, they furnished their own books and slates. In the early 1890s Charles B. Rhodes (later a U.S. marshal) taught a subscription school known as Hogshooter, in I.T., near Hogshooter Creek in present Washington County. Among his diverse group of pupils were Indian women and young men who were fugitives from the law. White as well as Cherokee, Delaware, and Quapaw youths also attended the school. Rhodes accepted cash as well as produce, which he bartered for other items that he needed. Students sat on pine planks, and pine boards painted with lampblack served as a blackboard. With plentiful wildlife in the area, mischievous boys hung dead opossums on the school walls, much to Rhodes's annoyance. In 1889 after the first land opening for non-Indian settlers in the Unassigned Lands of Oklahoma Territory, subscription schools developed in towns such as Kingfisher, Stillwater, Norman, and El Reno. 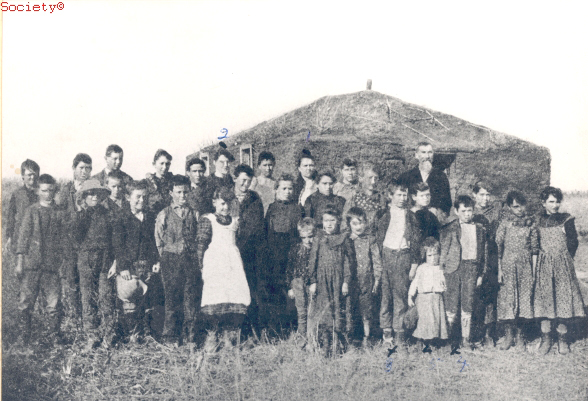 In Oklahoma City Lyman H. and Martha Newton North opened a school in a tent after the Land Run of 1889. Jennie (Mrs. Fred) Sutton also established a school in Oklahoma City in the rear of a hardware store on First Street between Broadway and Robinson streets. Nanitta Daisey, land claimant in the run of 1889 and a teacher, suggested that a subscription school be started in Guthrie, and soon pupils attended class in a tent. After the Sac and Fox land opening in 1891, Bertha Clark started a subscription school in her tent at Shawnee, and Lela Hendry taught the first subscription school at Tecumseh with twenty-five students paying $1.50 per month. Hendry paid three dollars per month to rent a frame building on Main Street. In western Oklahoma at the once-thriving town of Rathbone (Custer County), Malinda Huchison taught in a dugout and ran the post office at the trading post. Although subscription schools varied in the quality of instruction offered, they provided children an education until public schools could be built and supported by tax and bond revenue. Subscription schools in Oklahoma Territory gradually disappeared after the passage of the Organic Act of 1890, which provided for the establishment of school districts in the organized counties. In Indian Territory subscription schools probably continued until the passage of the Curtis Act of 1898, which authorized the establishment of free public schools. At 1907 statehood the Oklahoma Constitution called for the establishment of free public schools for all children. Frank A. Balyeat, "Education of White Children in the Indian Territory," The Chronicles of Oklahoma 15 (June 1937). Oscar William Davison, "Oklahoma's Educational Heritage," The Chronicles of Oklahoma 27 (Winter 1949–50). Gaston Litton, "Education During the Territorial Period," in History of Oklahoma at the Golden Anniversary of Statehood, Vol. 2 (New York: Lewis Historical Publishing Co., 1957). "Schools, Subscription," Vertical File, Research Division, Oklahoma Historical Society. Linda D. Wilson, "Schools, Subscription," The Encyclopedia of Oklahoma History and Culture, https://www.okhistory.org/publications/enc/entry.php?entry=SC005.